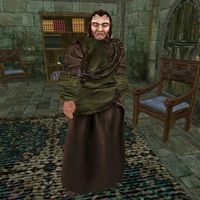 Antonius Nuncius is an Imperial priest who serves at the Imperial Cult Shrine in Fort Frostmoth. He is not happy at having been posted on what he calls this "terrible frozen excuse for an island" and has come up with a plan to get himself reassigned to Vvardenfell. He wears a common robe with matching shoes. He carries a silver staff, a bottle of mazte, a bottle of sujamma, and 250 drakes. Aside from his natural charm and ability to absorb fatigue from others, he knows the following spells: Second Barrier, Summon Clannfear, Wild Clumsiness, Wild Distraction, Drain Destruction, Drain Alteration, Drain Conjuration, Drain Mysticism, Drain Restoration, Drain Alchemy, Drain Unarmored, Drain Blunt Weapon, Strong Reflect, Strong Spelldrinker, Wild Spelldrinker, Absorb Agility [Ranged], Drain Blood, Absorb Luck [Ranged], Absorb Personality [Ranged], Absorb Speed [Ranged], Absorb Strength [Ranged], Absorb Willpower [Ranged], Blood Despair, Masterful Golden Wisdom, Masterful Smiting, Masterful Transcendant Wisdom, Masterful Red Wisdom, Masterful Unseen Wisdom, Vivec's Mercy, and Toxic Cloud.